Gael na Gaillimh GAA club in Galway City held a ‘Team Together’ event on July 14th 2018. 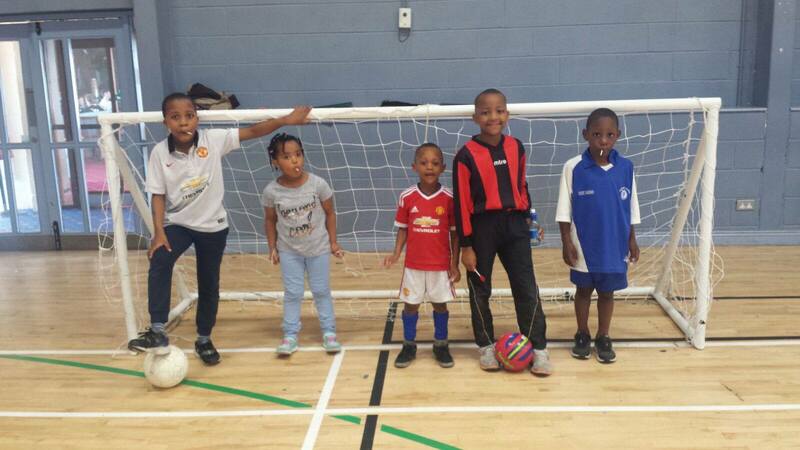 This event was supported by Show Racism the Red Card and involved an open day, where members of our community were invited to come and learn the basic skills and have some fun. The ultimate aim was to promote awareness about the club and promote our inclusive ethos, letting all community members know they were welcome to join. Specific effort was made in advance to link with socially excluded groups in our community. Namely, those living in direct provision. 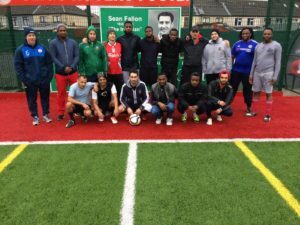 In order to achieve this, we linked with local initiatives such as ‘Walk the Talk’ a local group aiming to promote social integration of asylum seekers through sport, as well as the University of Sanctuary and ‘Fáilte Refugees’ local groups. 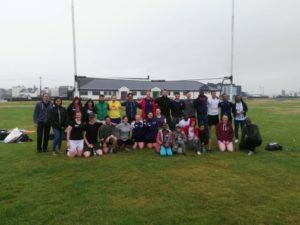 Collaboration was also made with Amach, the Galway LGBT volunteer run organisation which represents and advocates on behalf of the LGBTI+ community in Galway city and county. The event was hosted in partnership with Amach and Gael na Gaillimh. The event itself was a great success. 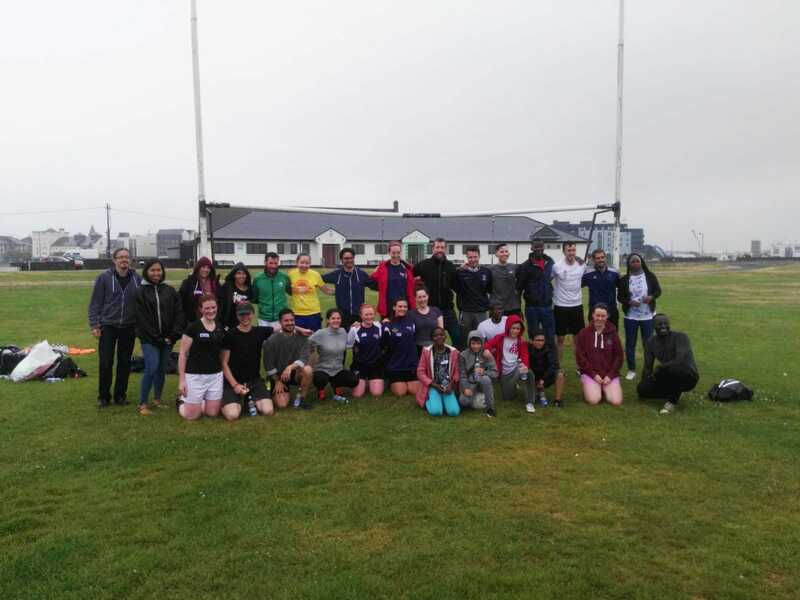 30 individuals attended which included existing members from Gael na Gaillimh’s women and men’s teams, and many new people from all over the world, including residents from two direct provision centres in Gawlay city. 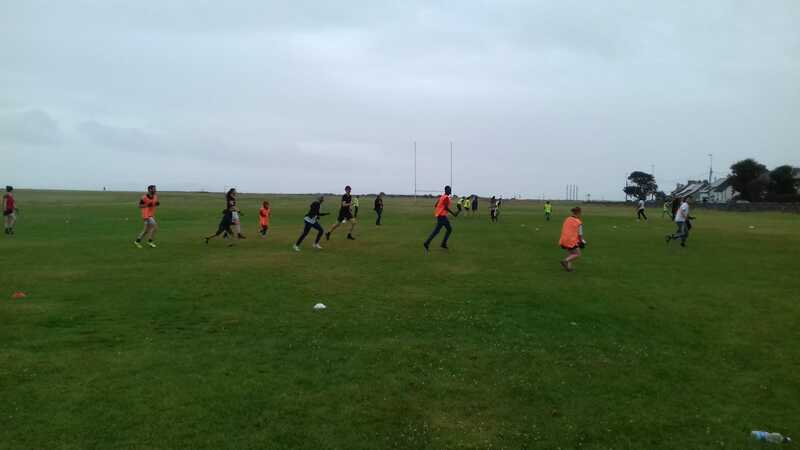 The day began with an introduction to the basic skills of Gaelic football and was followed by a mini tournament. A social event was held in the evening and catering was provided by One World Tapestry, a non-profit organization which aims to create a space for people to come together through food and experience an inclusive community while working with asylum seekers to help them use their own skills through volunteering. Overall, this partnership are encouraged that this has been a good first step to promote inclusion and invite new members to our club. Moving forward, we will maintain these links and open communication to hopefully encourage people to continue playing with us and invite new members in the future also. We are very grateful for the support of Show Racism the Red Card, without whom, this event would not have happened. On the eve of the United Nations (UN) International Day for the Elimination of Racial Discrimination, Irish anti-racism charity, Show Racism the Red Card (SRtRC) have released an infographic highlighting its work to tackle racism in Ireland. The UN International Day for the Elimination of Racial Discrimination is observed annually on 21st March, with activities and events taking place across the globe. Speaking ahead of the international day, Garrett Mullan, Executive Director of SRtRC today (20.03.18) said: “The UN International Day for the Elimination of Racial Discrimination is the perfect time for us to take stock on the work that SRtRC has been able to do to challenge racism. 200 schools and youth services participated in the Anti-Racism Creative Competition 2018. To assess our work, so we can improve our offer, we are launching three surveys to stakeholders for feedback. They surveys are short and will take no longer than 5 minutes. The presentation of Club Welcome plaques to conclude our Club Welcome Refugees programme will take place next Tuesday with Minister of State David Stanton TD presenting a plaque of appreciation to five sports clubs. The pilot of this programme was completed during 2016-2017 and is in recognition that sport has a big role to play in promoting integration. The five clubs receiving awards have carried out a programme of sustained work which will contribute to integration of refugees within Ireland. The programme was supported by the Community Foundation and the Ireland Funds and ran between 2016 and 2017. Thanks to support from the St Stephens Green Trust, we will be continuing this pilot programme and develop it as well as increase the number of clubs involved. We will be putting out a call for involvement in the 2018 programme shortly. 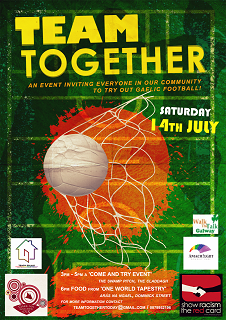 The five clubs are: Booth Road Celtic FC, Dublin 22, Ballinacurra Gaels GAA club, Limerick, Ballaghaderreen GAA club Roscommon, Emo Celtic, Co Laois and Sligo Rovers. 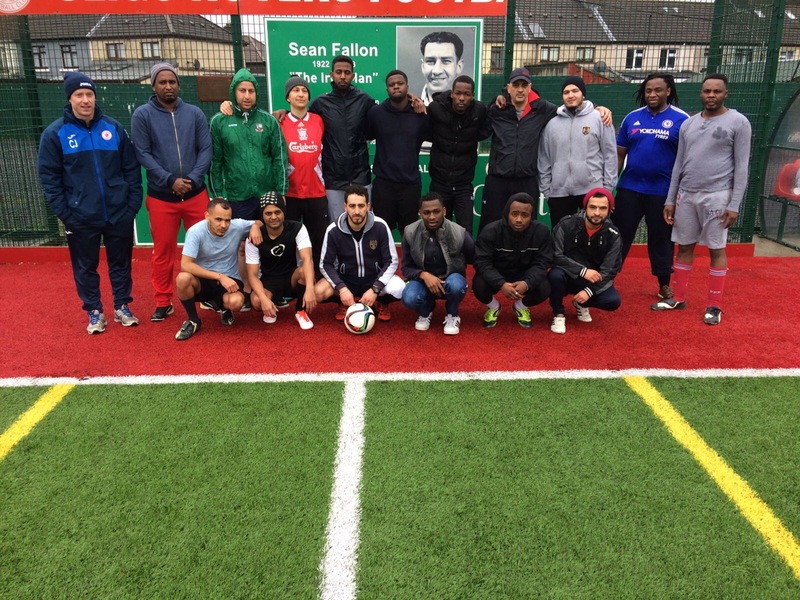 -Sligo Rovers delivered coaching sessions freely accessible to residents in Globe House, once a week over 20 weeks. Sligo Rovers not only offered training sessions for residents of Globe house but we also organised fully qualified coaches and also organised friendlies for the residents of Globe House against local grass root clubs in Sligo. -Booth Road Celtic Football Club hosted an open coaching evening with the FAI inviting residents from the Towers Accommodation Centre and also engaged with residents of the accommodation centre to identify and accommodate access for children in the centre to participate at different levels of the club including the club academy on Saturday mornings for children aged 4-7 and under 8’s to under 14s schoolboy teams. 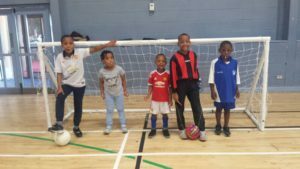 -Emo FC have provided free access to their all- weather facilities to residents in Montague House and also made a policy decision to allow free membership to their club to children of asylum seekers, in recognition of financial barriers. 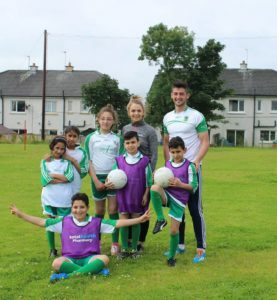 -Ballinacurra Gaels GAA club in Limerick engaged with local support agency Doras Luimni and have organised ‘Have a Go’ days specifically with children of asylum seekers and refugees. -Ballaghaderreen organised a club blitz involving some Syrian refugees (pictured above) and also a trip to Croke Park for the All- Ireland final between Roscommon and Mayo. The club now has Syrian refugees training with the Under 18’s football team. 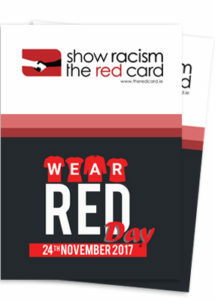 24th November marked the second annual Wear Red Day against racism hosted by Show Racism the Red Card. The programme called for participants to register activities for the day where those involved were invited to wear red, collect donations and deliver other activities to show their support. 5th – 19th October 2017 was FARE fortnight. FARE (Football Against Racism in Europe) is a UEFA supported initiative in which actions take place inviting participation in all affiliates to take action and support the anti-racism message and to spread the word that Football People support. Here are some highlights of the fortnight. Click below for the full report. More participants than ever before. Ireland’s James McClean is to be commended for speaking out about racist comments aimed at team mate Cyrus Christie in the aftermath of Ireland’s play- off with Denmark. The statement from Show Racism the Red Card (SRTRC) and Professional Footballers Association Ireland (PFA Ireland) comes after McClean revealed the racist tweets directed at Cyrus Christie. Christie’s teammate, James McClean, revealed the existence of the tweets at Saturday evening’s PFA Ireland awards in Dublin, citing it as an example of what the team had been subjected to in the immediate aftermath of the game. He said that Christie, already deeply upset over the outcome of the game, had shown the messages to other players in the dressing room at the Aviva stadium. “We spoke afterwards and it really got to a few players,” said McClean in an interview on stage after he had been presented with the award for Overseas Player of the Year. Alleged racist comments have been referred by the FAI to the Gardai for investigation. The tweet urged him to go to Jamaica and boasted about wanting to lynch him. Garrett Mullan (Show Racism the Red Card) said: “There is no place for racism in sport or on social media. We welcome the fact that the FAI and Gardai are taking action but social media outlets also have a role to play in responding to racism. As important as reporting such vile incidents is the support that someone receives from those around and in this case, it is clear that Cyrus Christie’s team mates have been affected by this incident. We welcome the fact that James McClean has shone a light on to some of the nasty elements out there. His support for his fellow team mate will help the team and Cyrus in particular, to emerge stronger from this incident”. Stephen Mc Guinness, General Secretary of the PFA Ireland: “We fully support all efforts to stamp out racism from the game and that includes comments targeting players on social media. The nature of this incident is really shocking and no player should be subjected to that and we hope that the perpetrator is called to account. This incident should serve as a message to all involved in the game from grassroots upwards that racism needs a response from authorities and team mates. It cannot be ignored”. The Football Against Racism in Europe (FARE) fortnight of action begins on the 5th and runs through to the 19th October. 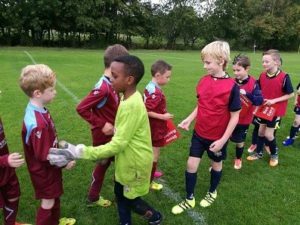 It is part of a UEFA supported initiative which will see actions take place in all affiliate countries where the anti- racism message is promoted at all levels of the game from grassroots to champions league and international games. In Ireland, it involves a partnership of the Football Association of Ireland and Show Racism the Red Card to deliver actions reach schools, clubs and the wider community. 4030 players from 62 clubs around Ireland will be taking part in activities to mark Football Against Racism in Europe fortnight of action. These actions will include children doing Champions League style handshakes and wristband exchange, with the home team presenting the band to players on the away teams. Actions will also include team photos with the Red Cards of SRTRC. At adult level, players will be warming up wearing the bibs with the Equal Game message, which is being promoted by UEFA. 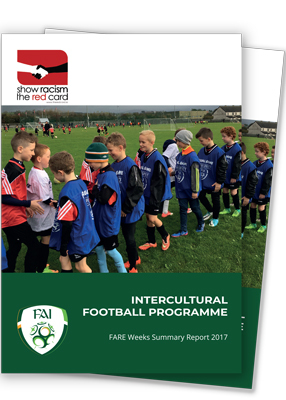 Development Officers of the FAI are also delivering the Show Racism the Red Card workshops to 4059 children in 120 schools over the fortnight. In Limerick, there will be an interschool anti-racism blitz with 14 primary schools participating. 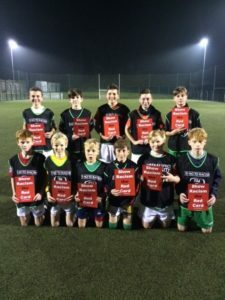 A highlight of the fortnight is the Irish Amputee International team will be holding up the Red Cards at the first ever UEFA Amputee tournament and will be posting it on their livesteam. This is a link to our audited accounts for 2016. The document includes directors report and full finance report.